Definition at line 189 of file llmessagetemplate.h. Definition at line 239 of file llmessagetemplate.h. Definition at line 192 of file llmessagetemplate.h. Definition at line 197 of file llmessagetemplate.h. 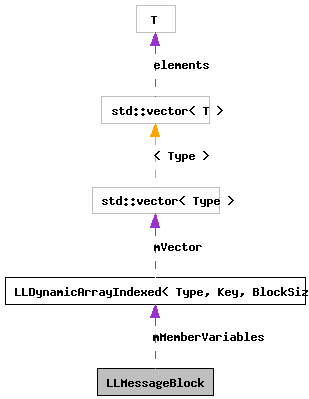 References LLDynamicArrayIndexed< Type, Key, BlockSize >::begin(), LLDynamicArrayIndexed< Type, Key, BlockSize >::end(), and mMemberVariables. Definition at line 202 of file llmessagetemplate.h. References llendl, llerrs, mMemberVariables, mTotalSize, MVT_VARIABLE, and NULL. Referenced by tut::LLTemplateMessageBuilderTestData::createBlock(), and LLTemplateParser::parseBlock(). Definition at line 231 of file llmessagetemplate.h. References LLDynamicArrayIndexed< Type, Key, BlockSize >::end(), LLDynamicArrayIndexed< Type, Key, BlockSize >::find(), mMemberVariables, and NULL. Definition at line 226 of file llmessagetemplate.h. Definition at line 221 of file llmessagetemplate.h. Definition at line 97 of file llmessagetemplate.cpp. Definition at line 240 of file llmessagetemplate.h. Referenced by addVariable(), getVariable(), getVariableSize(), getVariableType(), LLTemplateMessageBuilder::nextBlock(), operator<<(), LLTemplateMessageBuilder::removeLastBlock(), and ~LLMessageBlock(). Definition at line 241 of file llmessagetemplate.h. Referenced by LLMessageTemplate::addBlock(), buildBlock(), tut::LLMessageTemplateParserTestData::ensure_block_attributes(), tut::LLMessageTemplateParserTestData::ensure_variable_attributes(), LLMessageBlock(), and operator<<(). Definition at line 243 of file llmessagetemplate.h. Referenced by LLMessageTemplate::addBlock(), buildBlock(), tut::LLMessageTemplateParserTestData::ensure_block_attributes(), LLTemplateMessageBuilder::isMessageFull(), LLTemplateMessageBuilder::nextBlock(), and operator<<(). Definition at line 244 of file llmessagetemplate.h. Referenced by LLMessageTemplate::addBlock(), addVariable(), tut::LLMessageTemplateParserTestData::ensure_block_attributes(), and operator<<(). Definition at line 242 of file llmessagetemplate.h.